Emerging sunspot AR2297 has erupted again, producing its strongest flare yet: an M9-class explosion on March 7th at 22:22 UT. 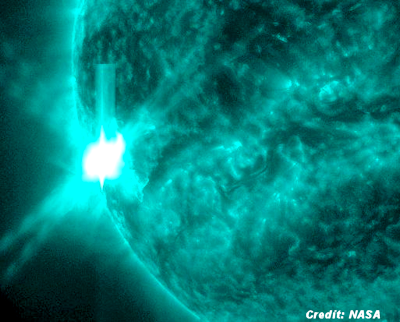 NASA's Solar Dynamics Observatory captured the extreme ultraviolet flash (above). Radiation from the flare ionized the upper layers of Earth's atmosphere on the dayside of the planet. This caused a moderate HF radio blackout over the Pacific Ocean. Mariners and hams operating at frequencies below 10 MHz woud likely have noticed disturbed and/or attenuated signals . . ..